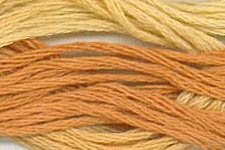 A hand dyed floss that begins with 100% cotton DMC six strand floss and gentle fabric dyes designed specifically for cotton. Available in a variety of beautiful colors that work well with punch needle and cross stitch. Sold in 5 yard skeins.